Woohoo!! Maybelline has become one of my favourite brands. I love their lipsticks, nail paints, kajal, liner etc etc and now the BB Stick. The BB Cream they had launched a year back I think) did not interest me much but I was like dying to get my hands on this. :) SEE HERE. Packaging ~ I find the BB Stick really cute and sleek making it travel friendly It comes in a twist up packaging with a cap. Texture ~ I find the texture very buttery and it just glides on. If it was to be a foundation, it would definitely be similar to Revlon ColorStay Whipped Crème Foundation. Coverage ~ It gives medium coverage and evens out my skin tone. Form the above pic you can see that I have light dark circles and the sides of my mouth is a bit dark and both have been taken care of. Also the redness between my eyebrows are gone. But it does not cover heavy dark circles and acne scars. 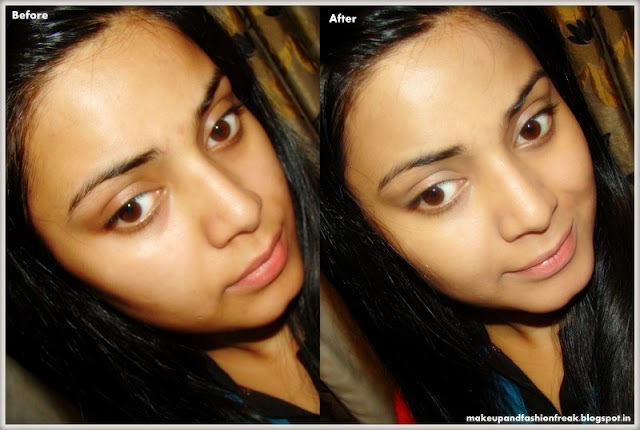 Finish ~ It gives a matte, radiant finish which looks quite natural and I love it. Shades ~ Only Two shades are available. HELL YEAH!! Of Course, if it suits your skin tone. My Rating ~ ♥♥♥♥♥ 4.5/5 Just because two shades are available.